Have you got the Skoolbag App? Skoolbag is a mobile App that communicates directly with iPhone and Android devices. Skoolbag provides parents with the most convenient way to receive school notifications. 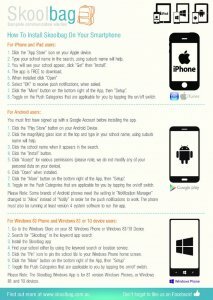 Simply download the Skoolbag App (see instructions attached). Make sure that when prompted to allow push notifications, you click on YES. Alerts – New information recently updated. eForms – Forms can be filled in and submitted directly to the school’s email. A signature box allows you to sign directly onto your phone. Report an absentee or change contact details for your child/ren. Parent Information – Download a uniform order form, Student Medical Information form, Visual Permission note, Head Lice Fact Sheet and more.